This year’s Burning Man festival is over and more than 18,000-20,000 Burners will be heading home via Reno-Tahoe International Airport over the course of about five days. This is one of the busiest times of the year for this airport, which usually handles about 7,000 departing passengers a day, and it’s one of the dirtiest and dustiest as Burners leave the playa covered in a fine dust and packing out all their garbage. To make sure all that playa dust doesn’t muck up the airport’s bagagge handling and security systems, the airport and the airlines require everyone to put everything in a plastic bags. The month-long National Cherry Blossom Festival is underway in the Washington, D.C. area and even the airports are getting into the spirit with cherry trees in bloom and buildings lit in pink at night. Pink lighting is illuminating the iconic main terminal of Washington Dulles International Airport and the parking garage stairwells at Ronald Reagan Washington National Airport. Inside the airports, there are cherry blossom-themed promotions and entertainment scheduled through April 16. There will be Cherry Blossom stilt walkers strolling through airport halls pre-and post-security from 1 p.m. to 5 p.m. on Fridays (March 24, March 31, April 7 and April 14). Entertainment on tap includes souvenir photos, paint sessions with a Japanese Sumi-E artist (black ink painting) and performances by Cellist Peter Kibbe at Dulles International on Thursday, April 6, from 9:30 a.m. to 12:30 p.m., and at Reagan National on Friday, April 7, from 9:30 a.m. to 12:30 p.m.
Several restaurants will be offering pink-themed menu selections and drinks through April 17 and shoppers who spend more than $100 (pre-tax) on food or retail can turn those receipts in for a free National Cherry Blossom coaster set. Social media followers of the airport Facebook pages can also win free ticket to official Cherry Blossom Festival events. Details here. It’s Oktoberfest season and Cincinnati/Northern Kentucky Airport (CVG), is helping kick off the city’s 40th Annual Oktoberfest Zinzinnati today (Friday, September 18) with Bavarian pretzels, soft-drinks and a band playing polka music between 8 and 10 a.m.
Fritz, the Oktoberfest Wiener Dog Mascot, will also be greeting passengers. Oktoberfest is also being celebrated at Denver International Airport this year, with the temporary “Beer Flights” beer garden on-site for a full week. Just in time for Oktoberfest season, Denver International Airport has brought back “Beer Flights,” the temporary beer garden in the center of the Jeppesen Terminal. The beer garden will be open from 11 a.m. to 7 p.m. daily from Sept. 19 to Sept. 27 and coincides with worldwide Oktoberfest celebrations and Denver’s Great American Beer Festival. Tickets are available at the door for $10 and visitors must be 21 or older with a valid ID to enter. The beer garden will feature eight picnic tables decorated by local artists, live music, talks by brew masters and brew trivia. Passengers who post photos of their “Beer Flights” experience on social media using #BeerFlightsDIA will be eligible to win prizes that include T-shirts and commemorative glasses, VIP brewery tours and more. The 70,000 “Burners” who attended last week’s Burning Man festival in the Black Rock Desert of Nevada have to go back to their regular lives now and about 22,000 of them re-entered the real world via Reno-Tahoe International Airport on Monday on Tuesday. That makes this week one of the busiest times for RNO airport and a week filled with unusual challenges. “There are lines of travelers with large, dusty bags and unique items like hula hoops being carried onto airplanes,” said RNO spokeswoman Heidi Jared, who explained that airlines were wrapping each piece of luggage in plastic to keep the conveyor belt system clean from the fine playa dust that can bog down the belt. Because Burning Man operates with a strict “leave no trace” policy, many Burners ended up bringing their garbage with them to the airport. “So RNO puts out extra trash bins on the front curb to collect a variety of items that Burners simply don’t want or don’t have room to take on the plane,” said Jared. Bicycles are the main method of transportation during the Burning Man festival and while many Burners put a lot of effort into decorating their bikes, they don’t plan to bring them home. 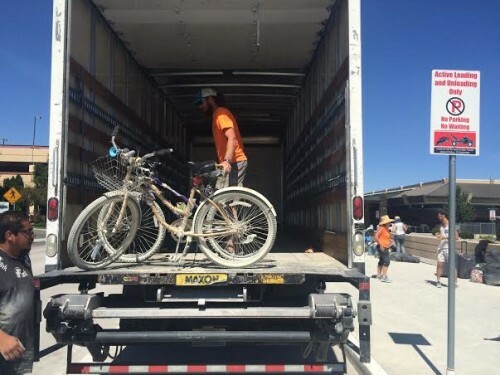 In the past, many bikes ended up left behind at the airport, but now the local Kiwanis club sets up a bike drop-off area at RNO to collect the cast-off cycles. The club then refurbishes the bikes and gives them to kids in the community.